11th November 2015 was a very special day for Christel House South Africa. Christel DeHaan was paying her annual visit and during a Special Assembly held for the School’s friends and donors, she was personally able to dedicate the Ron Haylock Music Room in tribute to him as a passionate lover of music and supporter of Christel House. As well as academic accomplishments, the Special Assembly celebrated dance, drama and of course music. 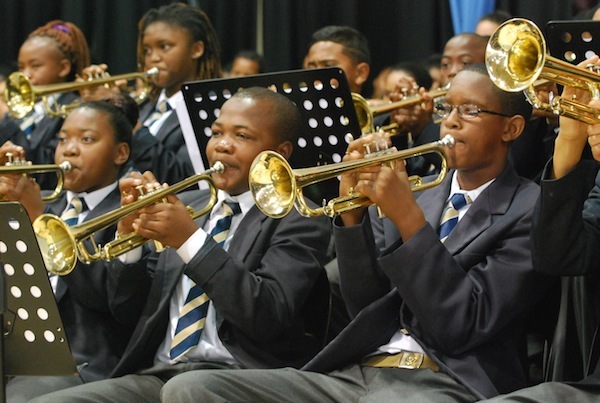 The School Band accompanied the programme and played their hearts out. The younger children played beautifully on their recorders and the Marching Bank ceremoniously accompanied guests to and from the School buildings. Two of our star student musicians told of their joy of being able to learn and play music and of the new confidence it has brought them. The Music Room was declared open with the cutting of a ribbon and a few words about Ron. It proudly houses three Honours Board that lists all the donors, many from the timeshare industry, who made generous contributions in his memory. They are displayed together with a picture of him and a tribute to his life. Plus of course, all those wonderful instruments that were procured, safely housed in lockers and cabinets. Please go to https://www.youtube.com/watch?v=LfrrHST-ths to see a short video of some of the day’s events. The joyful occasion marked the final stage of the Appeal in Ron’s memory. In his private life as well as his business life, he earned the respect and friendship of many around the world; we would like to express our deep appreciation to all those in the timeshare industry who have brought the gift of music in his name to the children of Christel House South Africa.